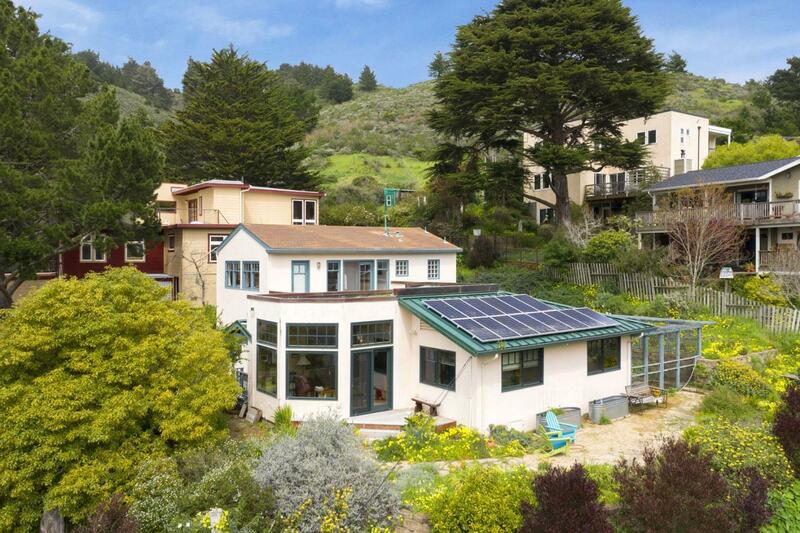 Beautiful Green Building Award Winning Home in Vallemar, Pacifica's Most Desirable Neighborhood. 115 Angelita has a wonderful warm southern exposure with views of mountains and hills. Located on a 10,000 SF garden. This 1867 SF house has 3 bedrooms & 2.5 baths. 2 bedrooms and 1 beautiful tiled bath are located on the first floor with the beautiful sunny, inviting living room and dining room, award-winning kitchen and laundry room/half bath. Upstairs is a wonderful large master suite with a bathroom with two sinks, a shower with two heads, a huge walk in closet and a patio with a view of the living roof. Also, a large office. Views from almost every window. This home is full of energy saving and environmentally advanced features as well as thoughtfully laid out storage and a beautiful patio that is toddler and pet safe. Too many features to mention, solar electricity, radiant heated floors (downstairs) and walls (upstairs). Close to SF & Airport and highways. Includes apn 018-096-230.